I’m super excited to post this outfit because….. this whole look is under $150! Guys! Isn’t this orange wall amazing? Polka dots have existed ever since the 1920’s to 1960’s, and still remain popular today. They never seem to go out of style! My ultimate favorite part about this dress is the black sheer on the upper part of the dress itself. It gives the outfit a flirty feel to it and I was drawn to it! I also styled this outfit with a faux leather jacket to give a bit of an edgy look. As much as I love feminine soft outfits, this inner NYC girl loves outfits with a cool edge. This is honestly the most affordable and most versatile black faux leather jacket I have found! This jacket is also an absolute MUST in every women’s wardrobe. FUN FACT: Here’s a brief history about how the polka dot pattern emerged: In the early 1830’s to 1850’s, the U.S was struck by a dance craze with the Bohemian and Czech people of Europe, known as the “Polka”. The term polka was actually a reference to the Polish woman, and was named after the Bohemian. Because of the circles their dance moves formed, the Polka Dots were invented. The “polka” craze eventually grew so popular that polka clubs began to create fabrics containing their pattern! Leave me a message of your favorite polka dot outfit! 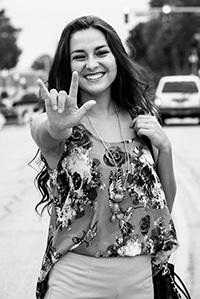 I’d love to hear back from my That’s So Fashionating readers! Polka dot dress: “Pick your poison,” Forever21 offers many polka dot dresses at amazing prices! 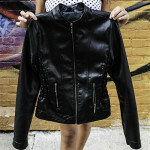 Black faux leather jacket: $60. A solid black leather jacket will work perfectly along almost anything you throw on. Get this jacket at H&M! Joe’s Jeans kitty-Lime shoes: $60 (on Sale & first-time shoppers get additional 10% off @ heels.com). This bright style from Joe’s Jeans delivers a pop of color with its vibrant lime fabric upper. NYX matte lipstick: $6. 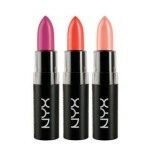 NYX Cosmetics: Highly pigmented richly formulated and long-wearing.